Salt Air was established by Grant Harnish in December 1992. Initially it operated a Grumman Widgeon on scenic flights around the Bay of Islands from Paihia. The company soon expanded to incorporate a land-based operation from the airstrip at Haruru Falls (near Pahia) and Kerikeri airport. Over the years the size of the aircraft grew from 3-seat Cessna 172s to 7-seat Cessna 207s. Helicopters were introduced in 2001 and these operate from the Paihia waterfront and are used for sightseeing and charter flights throughout the Far North area. Grumman Widgeon ZK-AVM at Ardmore on 11 October 1999. In April 2007 an 11-seat Cessna 208B Grand Caravan, ZK-MJL, was added to the fleet and it was this aircraft which introduced scheduled flights to Salt Air’s operations. Starting on the 17th of May 2008 Salt Air introduced its Salt Air Xpress service, initially between Whangarei and North Shore Airfield at Dairy Flat north of Auckland. The niche Salt Air had found was its being able to use the new Northern Bus Way into Auckland meaning passengers could avoid tedious crawling traffic and travel into Auckland during the morning rush hour and on the way out in the evening. The aim was to enable passengers to be able to travel from fly from Whangarei to North Shore airport and then offer a dedicated shuttle bus to Auckland Central’s Britomart – all this being done within an hour. At the time of the air service’s launch Salt Air co-owner Grant Harnish told the Northern Advocate, “We think Northland day commuters might welcome the chance to get away from what is involved in flying into Auckland airport - which means they over-shoot the centre of Auckland and then have to compete with heavy traffic to get where they want to go.” Initially three flights were offered departing from Whangarei on weekdays at 7.30am, 1.30pm and 4.30pm; and from North Shore Airfield at 8.20am, 2.20pm and 5.20pm. In addition a weekend service was available from Auckland to Kerikeri late Friday returning early Monday enabling the Caravan to return to its home base. Cessna 208B Caravan ZK-MJL arrives at Whangarei from Kerikeri for a brief stop before continuing on to North Shore on 19 May 2009. At North Shore on 5 July 2011 the aircraft's engine is kept running while ground staff load passengers and luggage for the shuttle to Auckland and the northbound flight. 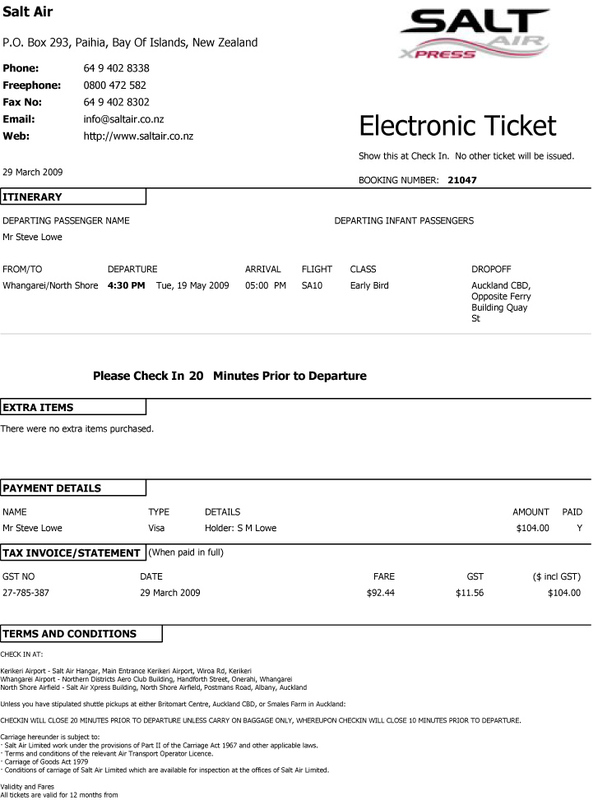 By mid June 2008 the service had been expanded to include Kerikeri and flights now operated Kerikeri-Whangarei-Auckland. 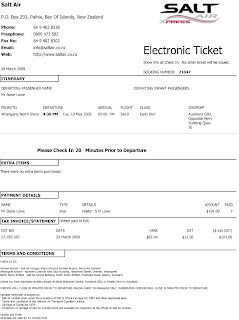 With fare of $119.00 each way to Whangarei and $149 to Kerikeri the service offered many attractions to people wanting to fly to and from Northland. Again, three weekday flights were scheduled but in mid January 2009 this was reduced to two flights on weekdays, a return morning and late afternoon/evening service with a return Sunday evening service. The company also offered a number of cheap fares, particularly aimed at the regular traveller. The timetable altered slightly between the summer and winter seasons. In October 2008 the company purchased a Gippsland GA8 Airvan, ZK-MAB. The Airvan was primarily to be used on the ½ Day Cape Reinga Fly Drive Tours but it was recorded on the scheduled service to North Shore on the 15th of November 2008 and became increasingly used on the service. In June 2009 the company’s visibility increased with its flights through Whangarei arriving and departing from the main terminal. I have flown on the Salt Air service twice, once from Whangarei and once from Kerikeri, and as their motto says “Northland - best seen from above.” I certainly saw a lot more from the Caravan than I did from the northbound Beech 1900s! 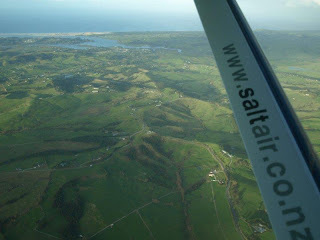 In October 2012 Salt Air announced the sale of the service to North Sbore-based Flight Hauraki. Chief executive Grant Harnish told the Northern Advocate that "he now wants to streamline the operation and concentrate on the tourism-based services. The scheduled services only generate only about 20 per cent of our operational income but take 80 per cent of our time to run. It's been a very successful concept and certainly put us on the map but it's the right time for someone else to pick it up and run with it. "We are a very small company and we don't have the ability to run a base in Auckland which is really needed to take the market to the next stage." 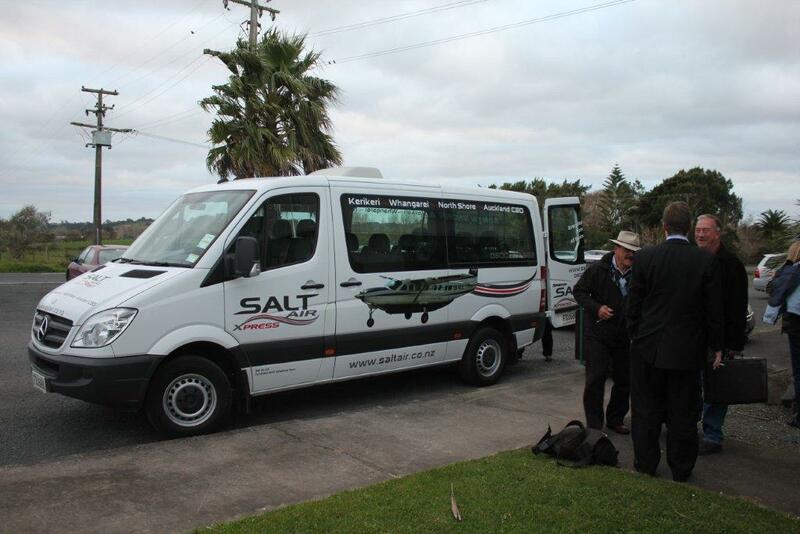 Salt Air's Northland Xpress service finished on the 31st of October 2012.